OSHA published a notice of proposed rule-making on June 1st to notify the general public about an update to beryllium standard to help provide clarification and simplify compliance1. The proposed rule-making is clarifying important definitions of trace amounts of beryllium, beryllium workspace, beryllium contamination, and dermal contact. On January 9, 2017 OSHA updated the beryllium PEL (permissible exposure limit) from 2.0 µg/m3 to 0.2 µg/m3 for an 8-hour workday. 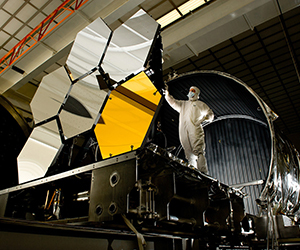 Short term exposure is allowed at a maximum of 2.0 µg/m3 for a 15 minute period1. The PEL and ST were updated due to the higher risk of health impairment and respiratory disease at the existing limit. This new PEL has reduced the risk significantly. The latest update will uphold the current PEL and help manufacturers understand requirements to be compliant with standards. Manufacturers and industries handling beryllium must be familiar with all of OSHA guidelines to prevent violations and ensure employee health and safety. Beryllium is a widely used and versatile element that naturally occurs in rocks, coal and volcanic dust1. It is a lightest of all solid and chemically stable substances. It is 40% more rigid and a third more elastic than steel. 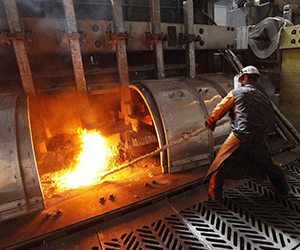 When created as an alloy, beryllium contributes hardness, strength, high electrical and thermal conductivity, and provides resistance to corrosion to improve longevity5. Also, beryllium is widely used in the aerospace industry due to the dimensional stability, non-magnetic and non-sparking properties1. Beryllium is used as a pure metal, beryllium oxide or made into an alloy with copper, aluminum, magnesium and nickel3. Beryllium oxide has a high capacity of heat making it an essential component of sensitive electronic equipment. Beryllium copper with just 2% beryllium provides a material that is six times stronger than copper alone2. The US Department of Defense has stated that beryllium is a strategic and critical material3. Beryllium has helped technology advance by improving electronics, appliances, and automobiles4. Beryllium can be found in a wide variety of products spanning numerous industries. Nearly half of beryllium use is within computer and telecommunications products5. Everyday products contain beryllium and have improved the speed of electronic technology. Using products that contain beryllium does not cause a health risk because the element is enclosed in most products and is not readily accessible during daily use4. Exposure to beryllium occurs through inhalation or skin exposure to dust, fume or mist 5. Beryllium is a naturally occurring element and enters the air from burning coal and oil, eventually settling as dust. Beryllium enters water from erosion and mixes with the sediment. In very small amounts, beryllium is found in air, drinking water, and food. Minimal exposure occurs with average daily inhalation of 0.006 µg and food ingestion of 0.12 µg2. These tiny amounts inhaled are not detrimental to health. Ingestion of beryllium is not dangerous due to the low absorption of beryllium in the digestive system. The EPA restricts the amount of beryllium released from industries into the air to a daily average of 0.01 µg/m3 over a 30 day period6. Most high levels of beryllium exposure occurs through occupational exposure2. OSHA reports about 62,000 workers11 are exposed every year to beryllium in 7,300 establishments3. Beryllium exposure is the highest in beryllium manufacturing, alloy production, recycling plants, foundry workers, furnace tenders, machine operators, machinists, metal fabricators, welders, dental technicians3, phosphorous manufacturers, ceramic workers, missile technicians, nuclear reactor workers, electronic workers, and jewelers5. Secondary exposure comes mostly from smelting and refining as well as recycling electronics or computer parts. People living near a beryllium mining facility can be exposed to beryllium, as well as family members of workers exposed to beryllium if contaminated clothing is worn home. Exposure of beryllium can have lasting health effects to the respiratory system or skin depending on the method of exposure. Beryllium exposure can cause an immune response resulting in a sensitivity or allergy to beryllium. Sensitivity to beryllium puts the worker at a higher risk to develop chronic beryllium disease3. Beryllium sensitivity develops on average in 1-6% of exposed workers but the rates can be as high as 16% in workers with high exposure rates7. Chronic beryllium disease causes scarring of the lungs7 possibly resulting in chronic destructive lung disorder and reducing the ease of breathing5. Loss of quality of life and potential decreased life expectancy may occur with severe chronic beryllium disease. Chronic beryllium disease develops at different rates with different people and can develop even at levels below OSHA’s PEL5. Symptoms of chronic beryllium disease include shortness of breath, unexplained coughing, fatigue, weight loss, fever and night sweats. If an employee that is exposed to beryllium is exhibiting any of the following signs, medical evaluation should be conducted to prevent further damage to the respiratory system. These symptoms are similar to pulmonary sarcoidosis and must be diagnosed to distinguish between the two diseases5. There is no cure for chronic beryllium disease only treatment with corticosteroids and oxygen5. Alternatively, acute beryllium disease is a rapidly developing form of chemical pneumonia and is caused from breathing high airborne concentrations of beryllium5. This condition is very rare. High exposures at or above 100 µg/m3 are fatal in about 10% of all cases5. Likewise, beryllium is a known carcinogen and can cause lung cancer5. 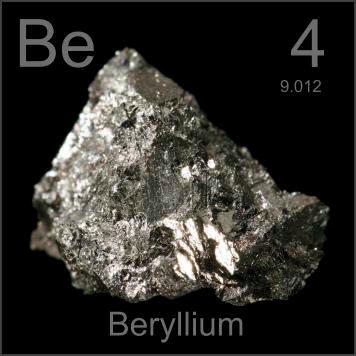 Beryllium has been shown to cause tumors in rats2 and is recognized by the International Agency for Research on Cancer as a group 1 carcinogen5. Exposure of 0.04 µg/m3 has a 1 in 1,000 chance of causing lung cancer7. Dermal exposure of beryllium can cause rashes or ulcers6. While dermal exposure has less lasting side effects, OSHA still requires employers to restrict exposure. OSHA proposed rulemaking notice defines trace amounts of beryllium, beryllium workspace, beryllium contamination, and dermal contact. The original rule, written on January 9, 2017, details disposal and recycling processes, exposure assessment practices, exposure monitoring procedures, medical surveillance requirements, and engineering controls for beryllium exposure. Trace amounts of beryllium – Workers that handle material with 0.1% beryllium by weight are considered to work with trace amounts of beryllium. These workspaces are exempt from OSHA standards as long as workers are not exposed to high levels of beryllium, the environment has little dust, and the employer has proof that the workspace is below the action level (0.1 µg/m3) at all times1. Primary aluminum production and coal-fired power generation industries work with trace amounts of beryllium, however, there can be high airborne beryllium exposure and must be assessed in order to ensure it is below the action level. To simplify, if the level of beryllium is at or above 0.1 µg/m3, the employer must follow regulations to keep level below 0.2 µg/m3. Beryllium workspace – Beryllium workspace is any workspace where a process is conducted that releases beryllium with the possibly of inhalation or dermal exposure of employees1. Excluded from this definition are places where the material handled contains 0.1% of beryllium by weight with less than the action level (0.1 µg/m3) of beryllium present in the air. In a beryllium workspace, clear boundaries must be created in order to prevent cross contamination. Protective clothing must be kept in this area to minimize exposure to outside of the beryllium workspace. Showers must be provided if the workspace is dusty and can contaminate the worker’s hair1. Engineering or process controls must be implemented to keep the level below the PEL and surfaces must be cleaned with HEPA filtered vacuum to reduce airborne exposure5. Beryllium contamination – An object is contaminated with beryllium if dust, fumes, mists or solutions are present with greater than 0.1% beryllium by weight. High air levels of beryllium are not expected with a low amount of dust present. Cross contamination must be considered and protective clothing should be kept within the beryllium workspace1. Dermal contact with beryllium – Skin exposure of beryllium is referred to as dermal contact with beryllium. This does not include materials with 0.1% beryllium by weight1. Disposal/Recycling – Beryllium waste must be disposed or recycled in a “sealed, impermeable enclosure” that is clearly labeled with the element1. Any container used for recycling beryllium must be properly cleaned and labeled as well. Exposure monitoring – Exposure monitoring is conducted to prevent employee exposure, assess levels of airborne beryllium and to monitor effectiveness of control devices9. 8 hour and 15 minute exposure levels are tested. The beryllium workspace must be reassessed when any change occurs to production, process, control equipment, personnel or the work practices9. Medical surveillance – Medical surveillance must be offered to employees that are exposed to at or above the action level (0.1 µg/m3), shown signs of chronic beryllium disease, have been exposed to beryllium during an emergency release, or recommended by a health professional5. Engineering controls – To maintain exposure to PEL, at least one engineering or process control device must be implemented. Engineering controls can be isolating the process in a ventilated enclosure or a local exhaust ventilation system10. If exposure still exceeds PEL with one device, multiple engineering controls must be used to meet the standard1. Recently, OSHA has pushed the compliance date for ancillary requirements to December 12, 2018 due to petition from a group of manufacturers11. Public comments will be allowed until June 30th. Other compliance dates have been unchanged. The final rule for trace amounts of beryllium exposure during disposal, recycling and potential skin exposure will still go into effect on July 4th. To remove harmful beryllium dust, fumes or mist for welding and production applications, Sentry Air Systems recommends our Model 400 and Model 300 welding fume extractors. These products are highly efficient by capturing the fume at the source. These welding fume extractors include a flame-retardant, self-supportive flex arm for easy and varied placement. Other benefits include small footprint, portability handle, heavy-duty casters for easy maneuverability, quick change pre-filter, and a variable speed controller. For this application, we suggest using a carbon filter pad combined with a HEPA filter, which has 99.97% efficiency on particles 0.3 microns or larger. The Model 400 welding fume extractor is best suited for light production while the Model 300 works well for lower usage situations. For medical and electronics applications, smaller portable fume extractors are available as well as ductless fume hoods. Ductless fume hoods provide an enclosed workspace to protect the operator’s breathing zone from harmful airborne fumes and particulate. 1. Occupational Safety and Health Administration. Federal Register: Vol. 83, No. 45, 7 March 2018, https://www.gpo.gov/fdsys/pkg/FR-2018-03-07/pdf/2018-04579.pdf. 2. U.S. Department of Health and Human Services. “Beryllium and Beryllium Compounds.” Report on Carcinogens, Fourteenth Edition, 3 Nov. 2016, https://ntp.niehs.nih.gov/ntp/roc/content/profiles/beryllium.pdf. 3. Occupational Safety and Health Administration. Beryllium, https://www.osha.gov/SLTC/beryllium/index.html. 4. “Beryllium is Important in Daily Life.” Beryllium, https://beryllium.com/benefits/importance-in-your-life. 5. Occupational Safety and Health Administration. “Health Effects.” Beryllium, https://www.osha.gov/SLTC/beryllium/healtheffects.html. 6. Agency for Toxic Substances and Disease Registry. Beryllium Toxicology ToxFAQs, Sept 2002. https://www.atsdr.cdc.gov/toxfaqs/tfacts4.pdf. 7. National Jewish Health. Chronic Beryllium Disease. https://www.nationaljewish.org/conditions/beryllium-disease. 8. “Exposure Assessment.” Beryllium Safety. http://www.berylliumsafety.com/guide-for-compliance/exposure-assessment. 9. “Exposure Monitoring Options.” Beryllium Safety. http://www.berylliumsafety.com/guide-for-compliance/exposure-monitoring-options. 10. “Methods of Compliance.” Beryllium Safety. http://www.berylliumsafety.com/guide-for-compliance/be-processing/methods-of-compliance. 11. 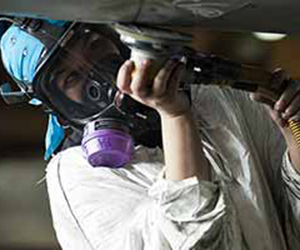 “OSHA to extend compliance date for parts of general industry beryllium standard.” Safety + Health: Official Magazine of NSC Congress & Expo, 31 May, 2018. http://www.safetyandhealthmagazine.com/articles/17117-osha-to-extend-compliance-date-for-parts-of-general-industry-beryllium-standard.